The big benefit of 802.11n, when it arrives, will be the data rate; theoretically it can hit 540Mbps or even higher, 10 times the standard 802.11g speed of 54Mbps. You'll need to wait for 12 months at least for that (even Belkin's own Pre-N router can't manage more than 324Mbps max), but you can enjoy one other upside of the new standard today, MIMO. 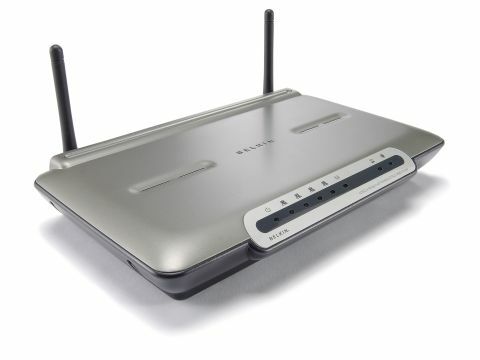 Multiple Input Multiple Output technology means that the range of a wireless network can be increased massively and Belkin claims that this, its enhanced 802.11g router, will reach 300 metres outdoors. It works by using a pair of antenna in conjunction, rather than the network choosing whichever of the two is providing the best signal, and bouncing radio waves off whatever surfaces are available (something called multipath propogation). If you're upgrading from an 802.11b router, the difference is immediate and dramatic; coverage blackspots around the house disappear and dropped connections as you venture outdoors are a thing of the past. It really does provide as wide a coverage as you could need. With this router stationed by a window, we drove 150m down to the end of our street, losing the connection only by turning a corner. Running at up to 108Mbps, it's twice the usual .11g rate with a compatible NIC, but you can get faster, consider Buffalo's Draft-N, to the right. Which means that the Wireless G is sitting in a strange area; you can get cheaper 802.11g kit that's adequate for broadband and basic networking, while Belkin's Pre-N router is just £10 more.